How do you make sure your latest speaker can withstand any type of music you throw at it? You test it and you test it hard. For Sonos, this was a case of analysing some of the hottest tracks in the world and use them to stress test their new speaker, the updated Sonos Play:5. Not hot as in popularity, but using songs that actually heat up a speaker because of their ferocity. The greatest challenge for the Sonos Play:5 was when alt rockers Rage Against The Machine were played on the machine. The band's riff-heavy, bass-laden sound was exactly what was needed to make sure the Play:5 could handle whatever consumers played through it. Sonos used Rage Against The Machine to make sure they didn't break the machine. "We analysed the digital tracks of all of the music out there and found the ones that consume the most power, because loud speakers don't have flat power responses, circular responses generate more power, and it turns out Maggie's Farm by Rage Against The Machine is the track that is the worst out there for consuming power," explains Jon Reilly, senior product manager at Sonos. "Maybe a listener will want to play Maggie's Farm on loop. They may also do that at 40 degrees Celsius, which is the highest operating temperature of the Play:5. So we test the speaker with Maggie's Farm at full volume at the highest temperature and we have to design a mechanism inside the Play:5 to ensure that none of the components exceed their specified temperature ranges. "These are things that could degrade the lifespan of the product so by stacking all of those worst case scenarios together we ensure robustness and reliability." For John and his team, this is just one facet to testing a new piece of kit at Sonos, a cog in a process that takes three years - something he is reminded of every day when he is in his office. "It's a little depressing," says Reilly. "I have the original model [of the Play:5] that they did in the design stage, before we had an acoustic solution figured out. I have that in my office and I'm like, 'why did this take three years?' It's because it's actually really freaking hard to make that initial vision a reality." This is especially true for the Sonos Play:5. It's a speaker that replaces the company's current flagship of the same name. After five years, the range has been given a complete refresh. "We wanted to start from scratch with the Play:5 and it was the best thing we could possibly do," says Reilly. "Nothing was reused. We took the best driver we had in house then figured out how to make it better, designing it again afresh. We took the Play:1 speaker, updated it and put three into this system." The result is the most-powerful speaker Sonos has ever produced, created with a sealed acoustic architecture, which offers better sounding bass than the original Play:5's vented casing. Inside are three 10cm woofers, 20mm tweeters on each side and a 22mm tweeter in the middle, all of which have been painstakingly built over the last three years to withstand Maggie's Farm. Tad Toulis, Sonos VP of Design, knows all-too well the time it takes to create something new at Sonos - he is part of a design team that make a sure that the look and feel of a device isn't compromised, even if it means things take a little longer. One of the most-interesting aspects of the Play:5 may well be overlooked by some - the logo tag in the middle of the device. It's not just a signifier for the brand but an important anchor point for the user. The Play:5 has ditched physical buttons in favour of touchscreen controls on the top of the device. The logo is at the centre of this control, so users can swipe volume up and down without thinking about where on the speaker the touch controls are, something that had to be fought for in the design process. 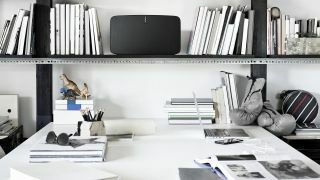 "One of the things that's fascinating at Sonos is when design and sound are in a great stalemate. It's a bit like how a diamond is formed under extreme pressure," says Toulis. "We feel that the creative process works really well when you live in that tension for a long time." This creative process was tested with the introduction of a tag which needed to have complete acoustic transparency. If the tag influenced the sound from the speaker in any way, then the engineers would not have allowed it to take centre stage on the device. "When two parties are asking you to move your bit, because of the importance of it, you realise you are standing on the precipice of a good problem," says Toulis. "The initial response was that you can't put anything in front of a driver but luckily we hit a breakthrough when we pointed out that the grill goes in front of the driver, so why not the logo tag?" To make it work, the design and engineering teams came up with a solution that was acoustically sound. This small tag was perforated with 800 holes, all lasered, to make sure there was no audible difference. This is on top of the 60,000 holes that the grill has to make sure the acoustics are as clear as they can be. "To me that's a perfect example of making things work," says Toulis. "There looked to be no outcome that was acceptable but we threw out our preconceptions and found a solution that met the criteria."